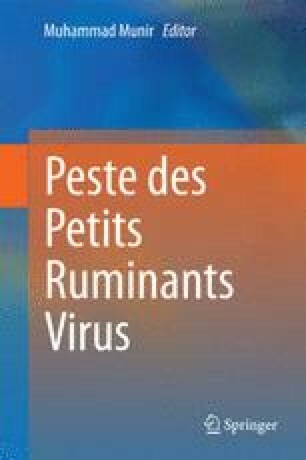 Molecular techniques have given various opportunities to detect the genome of peste des petits ruminants virus (PPRV) at high resolutions, and these powerful methods are very sensitive and specific. In the past, radioisotope-based techniques have been used for diagnostic purposes. However, because of associated hazards these may cause to human and environment, the radioelement hybridization techniques are no more in use. Alternative techniques such as hybridization with the digoxigenin/anti-digoxigenin system have been developed and are being practised. Moreover, genome amplification with different polymerase chain reaction (PCR) chemistries (conventional PCR, real-time PCR, multiplex real-time PCR, LAMP-PCR) has been developed to easily detect genome of PPRV, independent of lineage variations. Prior to these, adequate samples should be taken from sick animals and should be well conserved and transported rapidly to the laboratory for analysis. Despite convincing performance of these new diagnostic methods, currently, it is not possible to directly differentiate lineages of PPRV strains, which are now prevalent without distinct geographical demarcation. Currently, the amplified PCR products are sequenced to determine genetic classification of PPRV lineages and to establish epidemiological links.